*Total Return (includes dividends); the IBOVESPA does not include dividends. Things Move Fast. Slow Down. In this era of social media, it is important to remember that events which used to take hours, days, weeks, or even months to reach traditional media outlets (such as newspapers and broadcast programs) are now shared with millions of viewers within minutes. Due to constant “breaking news” we are all subject to instant analysis, gut reactions, and ultimately superficial responses to events. Often a more thorough analysis is brushed aside (or not covered) if it cannot be produced in a single paragraph. The one constant in life is change. Markets are no different. Domestic and international events will always impact global markets. What’s different about today is we hear about them instantaneously and with more emphasis because the collective media is incentivized to sensationalize news. After all, their objective is to increase circulation (now eyeballs and clicks). It has never been more difficult to block out the “noise” but it is a skill worth developing. Tariff “discussions”: It is clear that President Trump is utilizing former US President Teddy Roosevelt’s “bully pulpit” tactic as a part of the process to negotiate trade deals. It is useful to consider President Trump’s audience; the American public and more specifically, his base. The whole debate on tariffs is undoubtedly uncomfortable to watch and many are fearful that it will develop into something more serious. It is important to remember that while his tactics may be uncomfortable, what President Trump wants is a reduction in “unfair” tariffs and other restrictions in the European Union and he is willing to up the ante to get what he wants. The same is true in relation to China. Time will tell if his tactics will improve the lives of the American people but the action in stock markets suggest smaller US companies which typically do not export their goods abroad may be the ultimate winners. The Russell 2000 index (which consists of roughly 2,000 US small- and mid-cap companies) outperformed the S&P 500 index by nearly 5% through the end of June (+7.67% vs +2.65%, respectively). Strong US Dollar and the increase in domestic US interest rates: The US economy is strong, unemployment is low, and the US Federal Reserve is responding with measured increases in short-term interest rates. As a result, the US Dollar appreciated against most currencies in the 2nd quarter which negatively impacted the US Dollar denominated returns of securities in foreign markets. 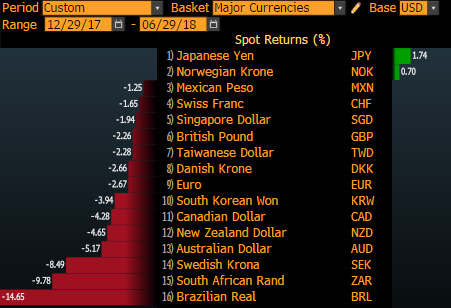 The pain was especially sharp in Emerging Markets but the strong US Dollar negatively impacted the asset prices in all major markets except Japan and Norway (see Bloomberg World Currency Spot Returns chart below). As an example, the widely followed MSCI Europe Stock Index was down just -0.07% on the year through June 30th in Euro terms but was down -2.93% in US Dollar terms. Don’t overlook currency fluctuations when investing abroad. Bond Losses: The iShares Core U.S. Aggregate Bond ETF (tracks the Bloomberg-Barclays US Aggregate Total Return Index) was down -1.64% through the end of June. It’s the largest bond ETF by assets in the world. It has been more than 10 years since the ETF (and the index which it tracks) has been negative during the first 6 months of the year. This serves as a reminder that you can lose money in bonds, especially when rates rise and your underlying bonds carry long durations. Growth versus Value: The streak continues. Through the first half of this year, the S&P 500 Growth index outperformed the S&P 500 Value index by 9.51%, extending a trend that has lasted more than 15 years! Consider this: classic growth companies like Amazon and Netflix were up +45.35% and +103.91% respectively for 2018 through June 30th while the famed value investor Warren Buffett’s Berkshire Hathaway was down -5.23%. If a manager or an investor did not have significant exposure to growth companies and more specifically, technology companies, they likely underperformed the S&P 500 Index through June. Value managers we speak to continue to report large differences between the intrinsic values of the companies they follow and their equity prices. As evidenced by the last several years, patience is required when investing in value stocks. 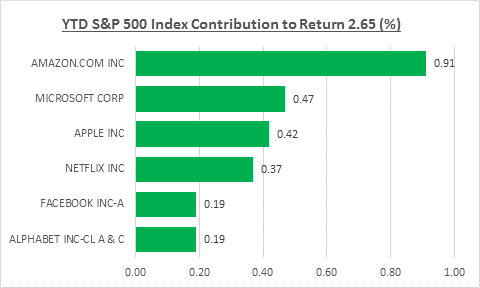 Six stocks make up nearly 100% of S&P 500 index returns: It has been widely reported that as of June 30th of this year, the basket of Amazon, Netflix, Microsoft, Apple, Facebook, and Alphabet (Google) has been responsible for over 96% of the returns of the index. This implies that the collective returns of the rest of the S&P 500 index were basically flat or break-even. In practice, if a manager or investor did not own these high-fliers, they likely underperformed. One of the themes that markets have been focused on is the effect of rising rates on stock prices. By one highly accepted measure, equities should trade on their net present value of future earnings. These future earnings are discounted by prevailing interest rates so as rates go higher (and earnings remain constant), today’s value of future earnings should be discounted more heavily. Most analysts, including ourselves, expect rates to continue to rise. So keep an eye on the rate of increase and do not be surprised if a rising rate environment causes short-term pressure on stock prices. Remember that most of us don’t invest in stocks for the short-term. While stock traders may be concerned with the potential negative short-term impact of rising rates, longer term investors should be comforted to know that equites can and have performed well during prolonged periods of rising rates. Why? Fearing inflationary pressures, the Federal Reserve typically increases the Fed Fund’s Rate as a tool to cool off a rapidly expanding economy. Stocks tend to rise when the economy is expanding so it shouldn’t be a surprise that stocks can do well while the Fed is increasing rates. Need evidence? 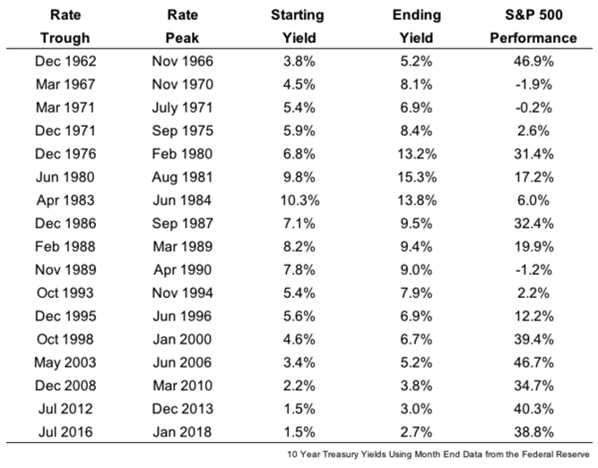 Since 1962 there have been 17 periods when the US Government 10-Year Treasury Notes’ yield increased by more than 1% (as it did earlier this year). The S&P 500 index saw total return gains in 14 of those 17 periods. Eight of those periods saw total returns of over +30%. The three negative periods of total return were a manageable -1.9%, -0.2%, and -1.2%. Source: Ben Carlson of Bloomberg Opinion/Ritholtz Wealth Management. So if your investment plans call for exposure to stocks, don’t let the headlines about rising rates get you off track. If history is any guide, it may pay to stay the course. (However, past performance is no guarantee of future results). When I got into this business in August 1973, the Fed Funds Rate was 11%, my friends were coming back wounded (if at all) from Vietnam, and President Nixon was entangled in impeachment proceedings. There was plenty with which to concern ourselves. Despite it all, American Capitalism prevailed and in turn, US stocks thrived in the ensuing 45 years. In 1972, the S&P 500 index closed the year at 118.05. Today, it trades above 2,700. When you feel like things are moving too fast, slow down and stay the course. It will likely pay off in the long run.